Let's kick of this personal touch gift guide with a little sparkle. If you didn't know Rose Gold is a bit of a thing right now, lots of people are adding Rose Gold hues to their hair, make-up and even décor. So it comes to no surprise that people want a little Rose Gold to their jewellery collection. How beautiful is this Personalised Bar Necklace* from Find Me a Gift? I know that this one is going to become one of my favourites and the fact that it's personalised with my daughter's name, make even more special This gorgeous necklace features a bar hanging vertically from a chain; it's a simple but striking design, suitable for everyday wear. This pendant is available in a range of colours, to suit everyone; you can choose from Silver, Gold and Rose Gold. However if you can't decide you could choose a two-tone dipped look which is available in Silver dipped in Gold, Silver dipped in Rose Gold, Black dipped in Gold or Black dipped in Rose Gold. What makes this even better is that it can be personalised, you add a message of you choosing to the bar and on as many of the side sides of the pendant, you have twenty-two characters to play with and available in the choice of two fonts. The perfect gift to add a little magic to someone's Christmas morning. If, that's not you how about this elegant Personalised Russian Ring Necklace. A timeless piece to cherish that can be worn day or night and the perfect addition to any outfit. Now there are so many different personalised gifts that you can seek out for them but I think that something that could come in handy, or useful would be a great gift. Just like this personalised Tea Mug* from Bags of Love. A personalised tea mug is a beautiful gift, which can feature a few treasured photos or designs, custom printed mugs will be a family favourite in any household and make an extra special gift. Tea makes everything better, but this personalised tea mug will definitely make any brew experience even more enjoyable. This personalised Compact Mirror* also from Bags of Love. A Personalised Compact Mirror is a beautiful gift, which can feature a treasured photo on the front, the photo is also printed onto a white, sparkly base colour, which will give your image a stunning, twinkly effect, that she will love. Phew we got there in the end. After reading this lengthy gift guide for a teenage girl, I really do hope that I have helped make buying for a teenage girl a little easier? I am sure that you are not short of a few ideas in the hope to inspire you and make their Christmas perfect. I'm sure that there is something within this little gift guide that will help inspire you to get something a little special this year, let me know your thoughts within the comments. Now let's talk about those personalised gift for little ones. I always think that it such a lovely gesture when we receive gifts for our daughter with her name on it, she also loves seeing her name now that she recognises the letters. So when we came across these fluffy dressing robes we had to get a couple for the children in the family. Make bath time and bedtime even more cosy and snuggly with a super soft baby robe. Your little one will be nice and warm and look super cute wrapped up in these must have robes. Something else that we also picked up was some personalised cutlery, as most of our daughter seems to end up in the bin. She has good intentions when she empties her plate, but along with the food tend to goes the cutlery too. Every year I like to get my husband something from our daughter and it means even more if it's something that she has had some involvement in and so I have found two of the perfect gifts that any grandparent or parent would love to open on Christmas morning. Babyprints specialise in providing a hand and foot casting service for babies, children and adults. Unlike hand and foot casting kits, they do all the work for you – with guaranteed quality results every time. Babyprints produce beautiful bespoke framed presentations, stand alone statues and solid silver jewellery, there is something to suit every occasion and budget. I love being creative and there is nothing more than I love than getting creative with my daughter so what better way to show appreciation for my husband than something especially made for him. Paint Me Ceramics allows you to be creative and at the same time be able to see the results of your efforts, there really is so much choice. The shelves are jam packed with a wide range selection of pottery that you can paint which range from £5 to £50! So you really are spoiled for choice. 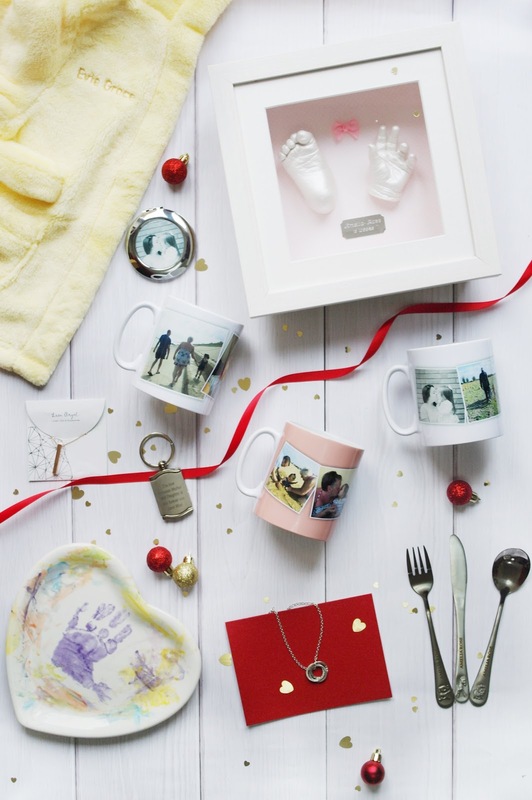 17 comments on "Gift Guide: Personal Touch"
Love the framed hands and feet, I think you can get them done in Mothercare sometimes as there is occasionally a lady with a pop-up stall at ours! I would totally love to get something like that done with our little boy! Wow wow wow!! I love personalised and bespoke gifts! Every year I go a bit mad trying to outdo myself for others. I love the feet the best! I love the idea of the hand and foot casting! I wish we had done it when Tyler was a newborn! Personalised gifts are the best! I love Rose Gold and that necklace is gorgeous. Personalised presents are so nice, I've bought my Dad something personalised from Etsy this year. Thanks so much for linking up at #KCACOLS. Hope you come back again next time.